I warmly welcome you to the launch of the project: Panda Partnership—UK schools welcome pandas from China, or Panda Pals for short. When China and Britain signed the joint panda research agreement earlier this year, I said this to British friends, ‘the pandas will come a few months from now’. Today, I can go on to say, there’re just a few weeks to go before the pandas arrive. And as people count down to their arrival, I’m sure all of us look forward to welcoming these two cute pandas to Britain. The arrival of these rare and much loved bears will attract a great deal of interest in China and Britain. This attention is very good news as Panda Pals will create a popular focus on the cultural and people-to-people links between our two countries. 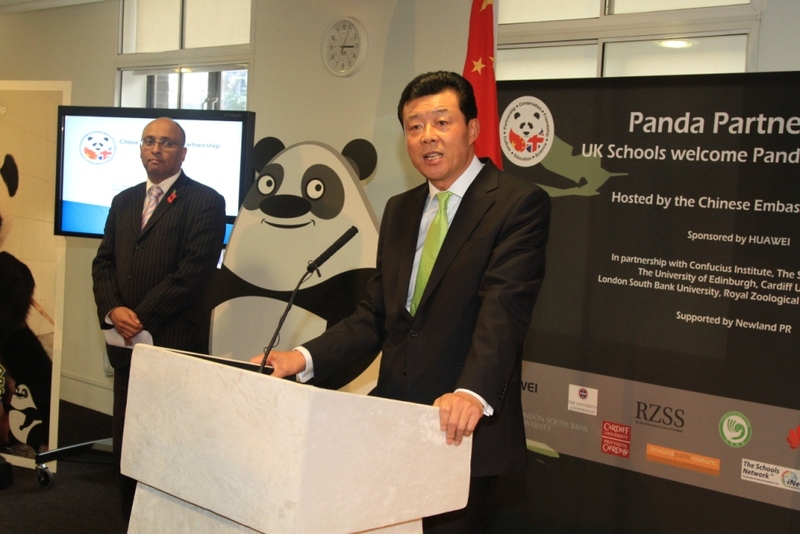 Indeed, in many aspects, Panda Pals is symbolic of the closer partnership between China and the UK. Let us take science links. At its core Panda Pals represents the growing scientific ties between China and Britain. The arrival of the two Pandas is part of a 10 year joint research programme to find out how human-bred pandas can survive in the wild. Then there are diplomatic links. Panda Pals also reminds us of the history of our diplomatic ties. Next year we will celebrate the 40th anniversary. 37 years ago the growing warmth of Chinese and British diplomacy was reflected by the arrival of two giant pandas Chia-Chia and Ching-Ching at London Zoo. Chia-Chia and Ching-Ching were a link to the shared commitment of China and Britain to create an environmentally sustainable future. It was these two giant pandas that in 1961 inspired the creation of the panda logo of the World Wildlife Fund. Panda Pals connects with the very important education links between our two countries. There are now 120,000 Chinese students studying in Britain. And more and more UK schools are teaching mandarin in all parts of the UK. Growing numbers of British young people are thinking of visiting, studying and working in China. What Panda Pals provides is a way of engaging young people in British schools. It is a way to encourage them to learn more about China through a universal love for Pandas. As the Panda Pals logo suggests, this project is about much more than conservation; it is also about science, culture, education and above all friendship and partnership. Through these themes we expect pandas to bring China and Britain even closer together. The pair of pandas’ arrival will be greeted with strong enthusiasm among children and young people. The Panda Pals Project is designed to build on this enthusiasm with serious education objectives. The project includes a primary school drawing competition, a middle school speech contest and a Panda Pals website. Panda Pals may also be collaborating with BBC’s Blue Peter on a possible naming the Pandas initiative. Now, let me say a few words about what Panda Pals is meant to achieve. First, we hope to build knowledge. As you know, there are loads of interesting questions surrounding pandas. · Why do they have black eyes? · Why do they like bamboo? · Why are there so few of them? I’m sure this Panda Pals project is an ideal way for children and youngsters to explore all these answers and many other aspects of panda conservation and Chinese culture and history. Second, we hope to spread fun and enjoyment into the learning process. There are panda games for young students to join and the winners will be awarded the chance to visit the Edinburgh Zoo to see pandas. Also there is a very big motivation to participate. The top pupil winner, and his or her parents, will be invited to fly to China and visit the pandas’ home in China’s Sichuan province. Third, we hope to strengthen friendship and understanding. Knowing pandas also means understanding more about their home country of China. 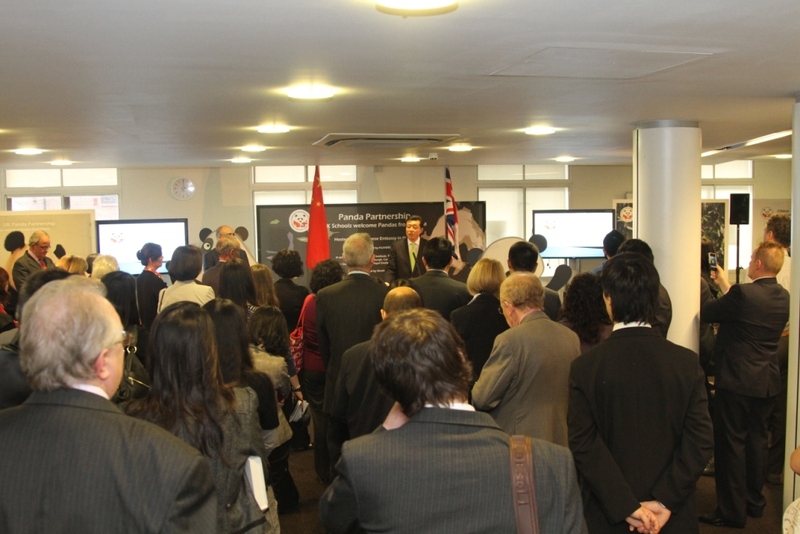 This opens the way for young British people to explore the Chinese traditions, people, its society and economy. More important, this is an excellent window into grasping China’s commitment to peaceful development, desire for win-win cooperation and quest for harmony with the world. Let me take this opportunity to thank Edinburgh Zoo, London South Bank University, the Specialist Schools and Academies Trust, the University of Edinburgh and Cardiff University. All of these distinguished organisations are our close partners in this project. Also I must extend my thanks to the Royal Zoological Society of Scotland for your strong support. And I would like to express appreciation to Huawei (UK) and HSBC for your sponsorship of this project. Through Panda Pals we can observe the process of learning amongst British pupils. So, I wish all the students good luck in the competitions and hope they all have fun and make more friends. Those students who win the Panda Pals contests will be invited to the Chinese Embassy early next year. I look forward to presenting awards to all the winners at the Chinese Embassy. In that way we can all gather to celebrate the success of the Panda Pals Project !